OUT of the blue last week, a companion and I launched into a conversation about Halle Berry. Like just about everyone else, we gave her her due for being beautiful. Some of us admire the actress because she rocks short hair and so do we. In any case, talk turned to her career. She’s a middling actress; we gave her that. Then we considered her various film roles. Companion did not like her in “Die Another Day.” She thought the acting was off. Frankly, Yours Truly did not recall the acting – it was probably OK – but I vividly remember the scene of her coming out of the ocean a la Ursula Andress in “Dr. No,” the first of the James Bond films. In fact, HB shattered the image of UA for me, I asserted. “Her best film,” I asserted, “is ‘Boomerang’.” Companion liked this one, too, though less so than me. In my estimation, HB has yet to do anything better than “Boomerang.” Hers has been a very uneven career, acting-wise. save Casey Welson (Abigail Breslin) from the man in her house. He’s not supposed to be there, incidentally. Through a wild coincidence (or poor plot development), Jordan has history with this intruder (Michael Eklund). I know. WT! (What the …!). While “The Call” is not one of HB’s best efforts – the acting tends toward tepid – she is not the only problem. The film has other issues around plausibility; it’s also derivative. And then there’s the ending. It ain’t thrilling. Better luck next time Halle. 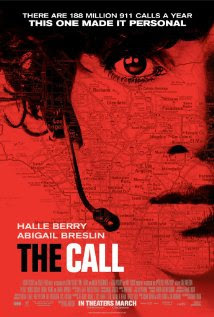 ”The Call: is rated R. Visit http://www.call-movie.com/site/ to learn more about the film. Rx.